Inspired by Disney's all-new live-action epic adventure The Jungle Book, in theaters April 15th, the National Honey Board (NHB) launches its "Golden Family Time" campaign to make family life in the kitchen deliciously easy and worry-free when done with one of Mother Nature's simple "bare necessities": pure, golden honey. For this springtime campaign, the NHB is joined by Laura Fuentes, author of the food and parenting blog LauraFuentes.com, founder and CEO of MOMables, cookbook author and media personality. The NHB and Fuentes have created a fun and flavorful array of child-approved recipes, including movie snacks and meals, all made with fresh, wholesome ingredients and complemented with a touch of nature's versatile sweetener to make them irresistible. "Family meals are a top priority for me," shared Fuentes. 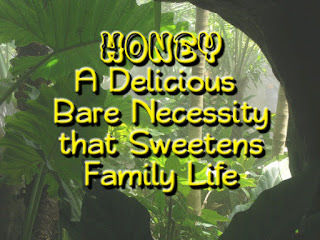 "Making tasty, fresh food with wholesome ingredients, like pure honey, is important to me and my family. I'm excited to join the NHB in sharing some of my easy-to-make children's recipes made with honey that are perfect to share at the table or during sweet family bonding moments, like family movie night at home. I hope families will be motivated to get in the kitchen and create these and other dishes using as many fresh and wholesome ingredients as possible." Considered an online authority on kids' health and wellness, Fuentes is the author of three children's cookbooks including The Best Homemade Kids Lunches on the Planet and The Best Homemade Snacks on the Planet and The Best Homemade Kids' Grain-Free Meals on the Planet. As a mom of three, her creativity and palate-pleasing savviness are demonstrated in the six recipes created for the NHB. Ranging from a naturally sweetened and power-packed breakfast to-go to get kids going in the morning to fun-to-eat school lunchbox meals, and even subtly sweet homemade takeout favorites served in cool lettuce cups, Fuentes's no-fuss meals will have children singing the praises of the kitchen's delectable bare necessities of life, including the magic of honey. This is no ordinary popcorn. This is the ultimate movie-time (or anytime) snack! Air pop or microwave the corn kernels and transfer to a large bowl. In a small microwave safe dish, add butter spread, honey, cinnamon and salt. Place in microwave for 20-30 seconds, until butter is melted. Using a fork, combine the honey-butter mixture. Pour over popcorn and toss until the mixture is distributed throughout. In a small bowl, whisk to combine honey, soy sauce, rice vinegar and sesame oil. Set aside. In a large skillet, over medium-high heat, place olive oil and onions. Begin to sauté onions until they become golden and translucent, about 3-4 minutes. Add garlic and sauté for an additional minute. To the soft onions, add in ground chicken and shredded carrots. Cook, stirring frequently and while breaking up the chicken pieces, until it's cooked throughout, for about 5-7 minutes. Pour sauce over cooked chicken mixture and combine. Place the lid, reduce heat, and simmer for 3 minutes. Top with bean sprouts, chopped cabbage, and roasted peanuts and cover for an additional 3 minutes. 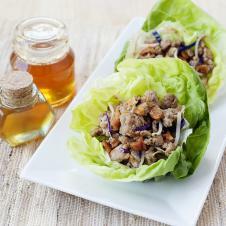 Scoop mixture into lettuce cups and serve. Find these and other tasty and kid-friendly honey recipes for family movie nights and meals any time of day visiting mielpura.org and momables.com, where you will also find some how-to videos, led by Laura Fuentes, which you can use as guides in the kitchen. Try a recipe out today with your kids; once they see how easy it is, preparing a honey meal will become a new bonding activity for the whole family!